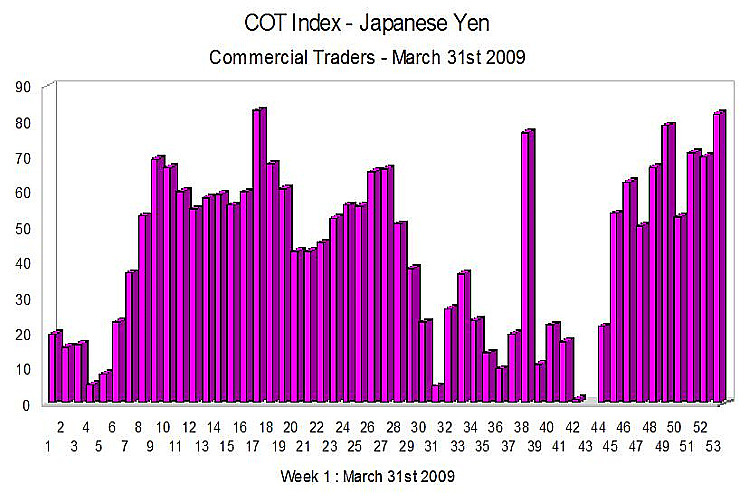 With Japan’s fiscal year end now passed, we can begin to focus with more confidence on the COT index for the Japanese yen. However, as always we need to bear in mind that the COT index must be viewed as a sentiment indicator and not a timing indicator and cannot always be correlated with the spot market. All the index is telling us at present is that the commercials are continuing to build long futures positions in the Japanese Yen and that this will translate into Yen strength at some point in the spot forex market. If you are considering trading in the forex markets it is essential to use the best trading platform and in my view there is only one platform worth considering, and that’s Metatrader 4. As one of the most advanced, yet intuitive, trading platforms available MT4 offers sophistication combined with simple order entry, execution and stop loss management and can be used with a host of expert advisors. Secondly, of course, it is so important to have an account with a reputable forex broker who offers ECN execution – in other words your trades are entered automatically into the market with no dealer or broker intervention, a huge benefit which allows you to scalp or trade in your preferred style, with no worry of slippage or of broker intervention on trading positions. The MT4 platform from ODL offers all the above with the choice of either mini or standard trading accounts so you can begin to trade with as little as 500 euros so why not download your free demo copy of the metatrader 4 software by clicking on the following link – download metatrader free – and get started today, and don’t forget to follow my daily posts for updates and analysis of the forex markets to help you with your forex trading – so good luck and good trading.